Last month we had some really hot days where it never cooled down. 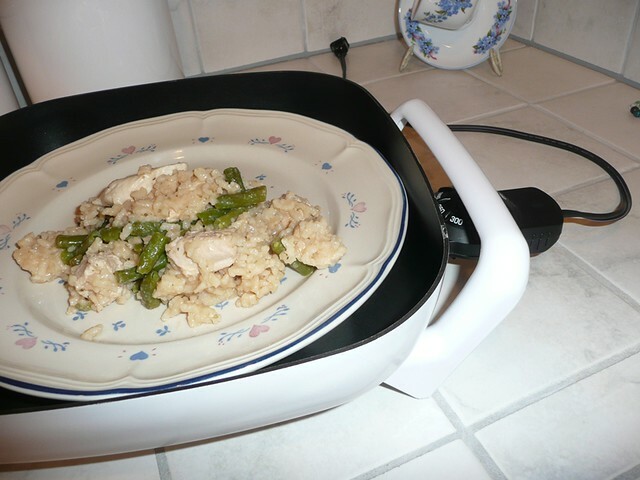 My idea was to not cook when it was really hot, but I didn’t know what to make. I mean, part of staying cool meant NOT getting in the car and going to the store! So, I was using what I had. I had decided to make chicken salad but give it a Mexican inspired flavor. I posted about it in September. In that post I mentioned my “regular” chicken salad. Well, I had a hankering for that the other day and I thought since I was making it, I might as well share the recipe. I know there are probably a million variations on chicken salad. I used to never like it because of the celery . . . but I don’t use celery. Here is what I do. Drain the liquid out of the can, then dump the chicken in a bowl. If you buy Kirkland canned chicken you have to use a fork to break up the chunks of meat. Chop the onion and pickles. Chop the bell pepper. 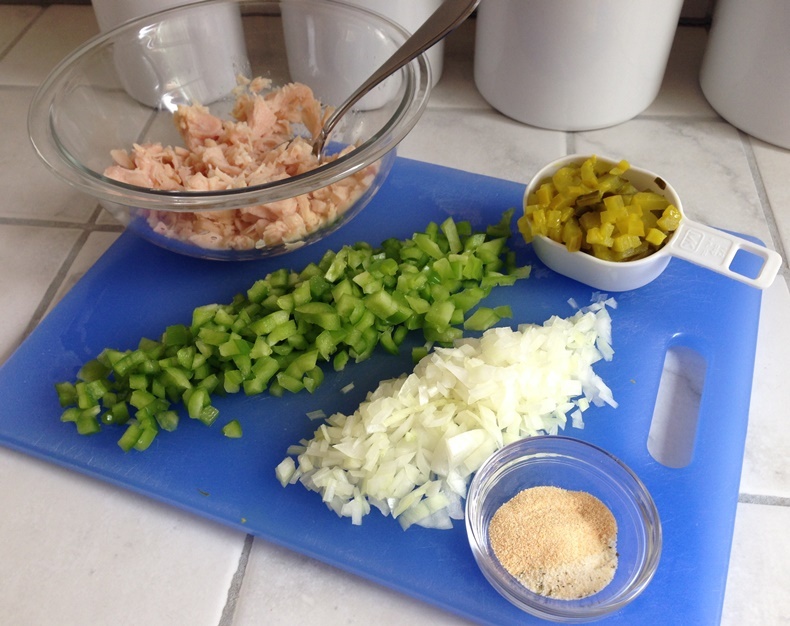 Add all the chopped ingredients into the bowl with the chicken. Stir it up. Sprinkle the garlic powder and salt over the mixture. Then mix it up. Add the mayo . . . more or less depending on how mayo-y you like your chicken salad. A sprinkle of pepper (unless you like pepper, then add more). Mix it all up. If you have time . . . let it set at least 20 minutes. This will let the flavors meld a bit. But if you are in a rush go for it. *The can is 12 ounces but a lot of it is water, so I think you end up with about 8 to 10 ounces of chicken. So if you are using chicken that is not in a can, I would start there. Also, the ONLY canned chicken I will buy and eat is Kirkland. I have tried other brands and the meat does not look good. It looks dark and there looks like there are a lot of “parts” and not just chicken meat. So I ONLY use Kirkland (Costco). I like chicken salad because you can eat it on bread, making a chicken salad sandwich. Or you can eat it on crackers. Today I actually had some in a tortilla. You can fill up a lettuce cup and eat it that way. Or you can just eat it with a fork. Just like I asked in my other chicken salad post . 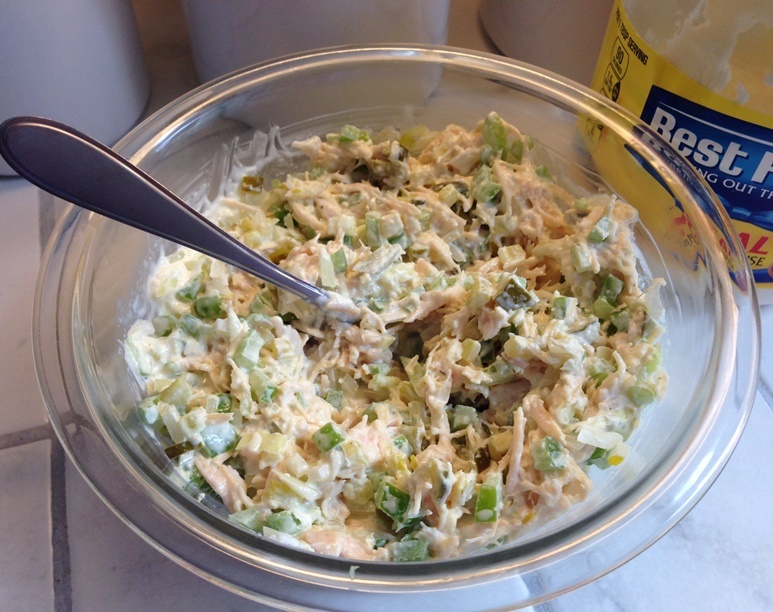 . . what do you put in your chicken salad? And what do you put your chicken salad on/in? I was trying to think of something to make for dinner with the limited meat that we had in the house. We have BEEF, but I haven’t gone there yet. I need to figure out how to cook the beef that we have, but I was not interested in figuring that out at that time. So I was trying to find something to cook that didn’t require much meat (we had a leftover pork chop) or any meat. 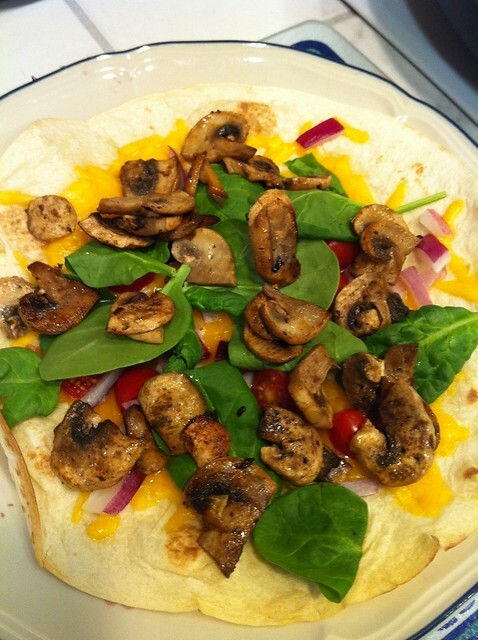 I remembered that my husband liked the flatbread I made once, so I decided to make it. We had ricotta, I would put that on top, chop up the pork chop and put it on top, then add a sprinkle of mozzarella. Well, as I was making the flatbread and I said to myself, “one tablespoon cornmeal” it dawned on me that I wasn’t using cornMEAL, I was using cornSTARCH. That is probably why the flatbread turned out so dense. I decided to continue since when I had made it last time, my hubby liked it. And it works, it just probably has a different consistency than if I used actual cornMEAL. So this isn’t really a recipe post (well not a NEW recipe) it is me just admitting and explaining the substitution. It works fine. And the pork chopped up and spread on it with a little mozzarella on top of that was really good. The flat bread is very dense, that is why I ended up calling it Flat-Biscuit-Shortbread. One of these days I might think to buy cornMEAL and make the recipe as per the real ingredients! The information on the internet about the difference between cornstarch and cornmeal is not very detailed. They are obviously both made from corn, but one (cornstarch) is made from grinding just the endosperm of the kernel into a fine powder. The other (cornmeal) is made from grinding the whole kernel. Cornmeal is not ground as fine as corn flour. Yet, Wiki does go on to say that the most common cornmeal in the United States “has the husk and germ of the maize kernel almost completely removed”. Cornstarch is usually used for thickening sauces and it does not have the strong corn flavor that cornmeal has. Could be because it is not the whole kernel. I am familiar with cornmeal being used in batters to coat things, like corndogs. And used for things like cornbread. There are many, many, many uses for it, but as you might have guessed, since I don’t have any, I don’t use it. Combine the flour, cornmeal, baking powder, garlic powder, basil, and garlic salt in a bowl. Stir until ingredients are well mixed. Add olive oil and water mixing until all the ingredients are incorporated and it forms a smooth dough. Form the dough into a ball or a log – something to get you started into the final shape you want. 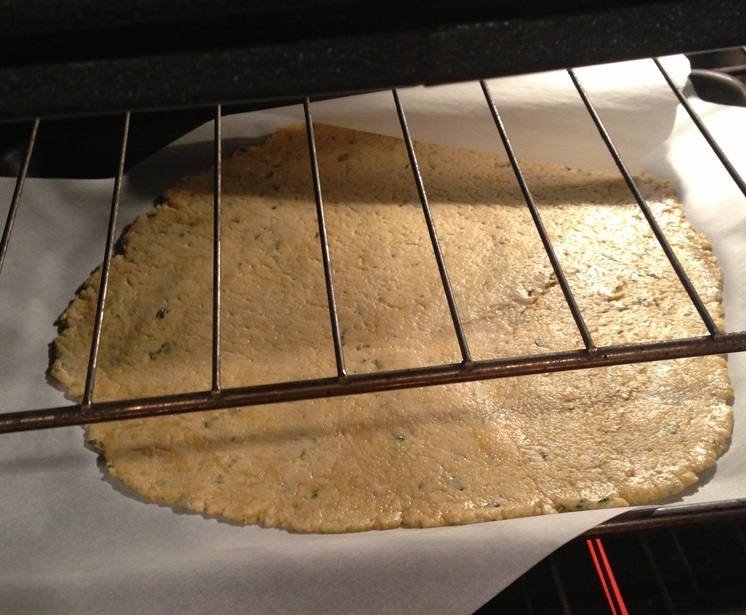 Place the dough onto a piece of parchment paper large enough to fit the pan you are going to bake it on. Then roll out the dough until it’s about 1/4 inch thick in the shape you want. Lift the parchment paper with the dough on it and place it on your baking sheet. Bake it in the oven at 400° F for 12 minutes until the edges start to turn brown. Remove the flat-biscuit-shortbread and top with ricotta cheese and a sprinkle of salt. Then place back in the oven for three minutes. Then top it with whatever else you want. I once used Leeks and Mushrooms. Another time I used pork. What about you? Do you use cornmeal? Do you use cornstarch?